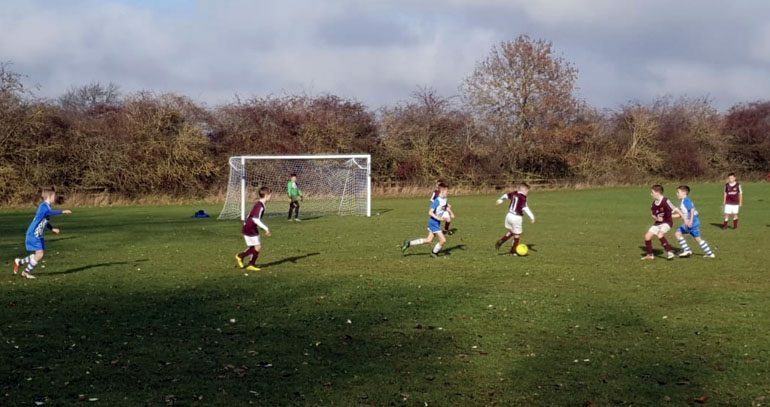 The footballing action continued for the Aycliffe Juniors teams over the weekend. There was some strong performances and great effort form the players across the age groups. The Under 7’s White faced Shotton Colts and it was a tight match with the teams level at 1-1 with five minutes left. It was Shotton though who finished the stronger team to win 3-1. Jack R scored the Aycliffe goal and Joel T was the man of the match. The Under 7’s Juniors were up against a strong Seaton Carew team at home. They played some good football and created chances but things didn’t go their way with Jonah’s goal not enough to win the match. In the development game Jonah, Kai and Mason scored and the morning’s man of the match was Dom. The Under 8’s hosted Trimdon and their great performance did not deserve a 2-1 defeat. The players were all superb and the goal was scored by Evan. The development game was won 3-2 with Alex (2) and David scoring. The Under 9’s played a strong Darlington FC Quakers, they lost 3-0 and Jack was the man of match. The development game also ended in defeat with Ethan the star player. The Under 10’s White faced Billingham United and they went ahead with a goal from Jayden. Both teams battled hard but it was Billingham who won through by two goals to one. Ido was the man of the match for a fine performance in goal. The Under 11’s White played Leven at Woodham in another really close game. It was 3-2 at the break with Niall Armstrong scoring both Aycliffe goals. The second half effort did not get its reward and the visitors scored with the last kick of the match to win 4-2. Harvey Lee was the man of the match. The Under 11’s Black were away at Prissick Rovers and after going a goal down they raced to a 8-2 victory. The goals came from Jake (5), Noah, Rhys and man of the match Jacob. The Under 12’s played Saltburn at Woodham and put in a great effort. Thomas and Zak both scored in a 2-2 draw and Daniel was the man of the match. The Under 13’s Russell Foster League team played Sunderland Pumas at Woodham. The match was evenly poised at half time with the score at 1-1. The Sunderland team went on to win 2-1 despite Aycliffe creating several chances. Herbie scored the home team’s goal and Louis was the man of the match. The Under 13’s TJFA League team were up against an in form Leven team. They needed to battle to get anything from the game and that is what they did. Twice coming from behind with headed goals from Evan and then Taylor to secure a 2-2 draw.